Is university just a place to get a piece of paper? Or can it be a place to grow personally and academically? This essay will explain why it’s better for most students to move away from home. Living at home while studying has many advantages. It’s more comfortable than student accommodation. Rent and laundry are free, and there’s no need to cook. Your favorite DVDs are still in your old room, with the Justin Bieber posters and the Hello Kitty collection from when you were nine. The same old friends live nearby, although fewer because some have gone to college now. Yes, your new college friends across the city are cold and penniless. But they sit in cafes for hours discussing politics and playing guitar and talking to that cute Korean student. The dorms are noisy, but there are always new people to meet. Some of your new college friends have signed up with a Japanese conversation club; others are going abseiling soon. While you snooze on the long uncomfortable bus ride home, they are working together in the library on next week’s assignment. While you sit with your mother watching television watching, they are exploring clubs and giggling during poetry readings. Clearly, college is about more than a certificate. It’s about learning – not just academically, but about other people and the way you view the world. It doesn’t mean forgetting your old life, but it does mean opening up to new ideas and new experiences. Give it a try! You can always go home at the weekend! 258 words, 19 sentences, 13.5 words per sentence. This essay has exactly the same ideas and structure as a much longer essay (413 words) here. In many situations, ambition is highly regarded. Job applications often ask for ambitious candidates. Entrepreneurs are admired for their ambition and energy, and dynamic countries and cities have ambitious plans for growth. Although ambition has a dark side, this essay will show that we should not be scared of ambition. Ambition is often associated with negative characteristics such as greed, intolerance, and the drive for power. In the movie Wall Street, the character Gordon Gecko said that greed was good: there were no limits to how much money you could make or how big a company could get. Ambition is also often associated with ruthlessness. It can block out human feelings such as friendship, respect for others, or compassion. Finally, ambition is regarded as being solitary: the individual wants power at any price, and the reward is often loneliness or isolation. However, these negative associations should not stop us from being ambitious. First of all, being ambitious means understanding that we have value and that we can become better. Without plans, we plan to fail, but ambition helps us map out paths for success in our personal, family, or professional lives. Ambition also teaches resilience. When problems occur, ambitious people find a way around them. In addition, being ambitious should make us adaptable and tolerant: by including other people in our ambitions we all move forward. Ambition does not have to mean a solitary goal: it can be a vision for a city, the elimination of a disease or the improvement of a community. 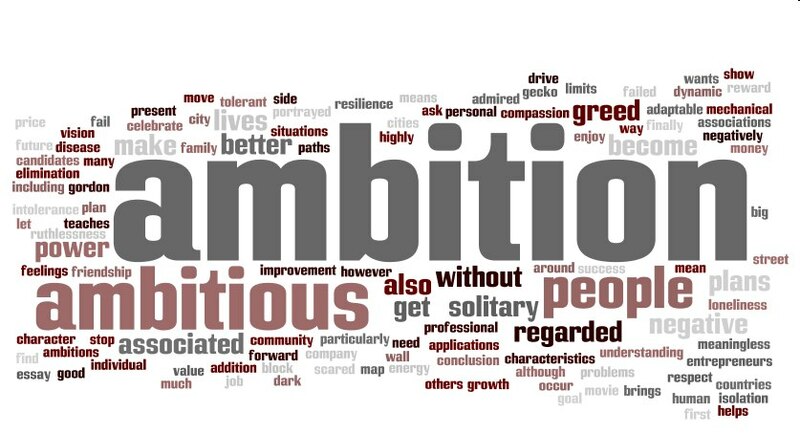 In conclusion, ambition is often portrayed negatively, particularly by people who have failed themselves. We should not let these people get us down. Without ambition, our lives become mechanical and meaningless. We need to celebrate ambition and enjoy the better present and future it brings. Many people have a simplistic view of attitudes toward age. They suggest that in Western societies old people are not respected, while in Asian societies elders are revered. Similarly, youth is either highly valued or ignored, depending on the culture. In this essay I will show that some of these views are mistaken. First of all, old age is valued everywhere. It’s true that in the Far East, people respect grandparents, older leaders, and bosses. However, if we look at Western countries, we also find politicians in their sixties or seventies, despite free elections, and company executives in their sixties, despite strong business competition. In addition, as life expectancy increases, older people are becoming more important as consumers and voters. Finally, even in countries where elders previously could not be challenged, people are realizing that old age does not always mean wisdom. The old way of running families, companies, or countries may not work today. We see many images of young people on our screens, but does this mean they are valued more? In fact, these images are just marketing: parents spend money on children, and older people spend less on mobile phones or beauty products. Just because shampoo ads portray young women does not mean that young women run companies or countries. There are very few young politicians or company bosses anywhere in the world, apart from exceptions like Bill Clinton or Mark Zuckerberg. The reality is that although society seems obsessed with youth, older people still have power and wealth. They are the ones who make money and decisions. We must be careful not to confuse images with reality. You can find a longer version of this essay here. Is university simply a place you go for a few hours a day to get a piece of paper? Or is it a place where you grow and change intellectually, socially, and emotionally? In this essay I will explain why I think it’s much better for most students to move away from home when they are in college. Living at home while studying has many advantages. It’s generally more comfortable than college dorms or student accommodation. You have free laundry, free food, and free rent. There’s no need to learn to cook: your mother knows exactly how you like your Milo. You can keep watching your favorite cartoons and television programs, the same ones you watched while in kindergarten, primary school, and secondary school. You have your own room, so you don’t have to worry about your stuff, and you can enjoy the same posters that you had on your wall when you were 6, and 10, and 14. In addition, you have the same friends you had then, and the same games and social life as you did back when you were a girl guide. Your Hello Kitty collection is there, along with a tooth you lost when you were six and the the pyjamas that your embarrassing aunt bought for you on your 14th birthday. Meanwhile your new college friends far away on the other side of the city may be cold and penniless, but they are sitting in cafes for hours discussing history or politics and playing guitar and talking to that cute Korean guy from the same class. Their beds are small and the dorms are noisy, but there are always new people to meet and new clubs to join. Some of your new college friends have signed up with a Japanese conversation club; others are going abseiling this weekend. And they seem to get more study done too: when you are snoozing on the long bus ride back to your parents’ place, they are in a big group in the library or the canteen finishing next week’s assignment. While you sit with your mother watching television and talking about your day, they are off exploring clubs and giggling during poetry readings. Clearly, college is about more than the grade at the end. It’s about learning – not just academic learning, but learning about yourself and other people and the way you view the world. It doesn’t mean forgetting your family and friends, but it does mean opening up to new ideas, new experiences and new people. Give it a try! You can always go home at the weekend! 431 words, 20.5 average words per sentence. Very long for IELTS, and with far too many words per sentence on average. Have a look at the same essay, with the same ideas and structure, but in 258 words here. How people treat children varies from society to society and from family to family. Some children seem to be almost wild, while others are expected to follow strict rules, almost like miniature adults. In this essay I will say why I think children benefit from freedom but need some guidelines. We often think of childhood as a time of freedom. This is very strange, since, as children, we have no choice over who we live with, what we eat and or generally what we do. However, in the care of a good family, children are free to play, learn, run, fall, talk, shout, cry or be happy. They know that they are loved and that whatever they do they have someone to turn to. However, very few parents, whether in traditional or modern societies, allow their children to follow their instincts completely. They are trying to get their children to succeed into society, and as a result, try to make their children learn acceptable social behavior. People are often quick to criticize the way other people raise their children, and there is a lot of pressure on parents to produce perfect children. Parents of course have to set some limits. Sometimes the limits are for the children’s safety: they are not allowed to play here, go there, or sit in the front of the car. There can be limits on the kind of food or the time for bed. There can also be social limits: children have to act a certain way with parents or older family members or with people outside and they have to learn to share, to play with other children, to go to school. There is a constant negotiation of these limits, but it’s often said that children are happier knowing that there are limits. It’s impossible to set a rule that will work for all children, all families, or all societies. However, childhood should be a time of learning and exploring, and that means pushing boundaries and finding how far you can go. If children don’t have some limits, they will not have a structure in their life and a framework for the future. What does being rich mean? Does it mean having the most expensive cars, the biggest houses and the most luxurious holidays? Or does it mean being able to use your money to do what you want, enjoying yourself and helping others at the same time? In this essay I will discuss if rich people have a responsibility to help others, and if only rich people can help others. To begin with, I think being rich is a very relative term. If I have 20 dollars and my friend has only 5, then I am richer than him, even though to a millionaire we are both poor. But I can still help him: we have enough for a meal or two. Almost all of us, rich or poor, are able to help others. Some people give publicly, while others give without expecting anything in return- not publicity, not a payback, not even gratitude. Some people give time, which can be more valuable than money. Others give expertise or knowledge. Some just give a hand, literally. Although their time may be limited, rich people also can do all of these, but they can also help in other ways. They are often powerful, and can help change opinions or laws. They have rich friends and together their money and connections can make a difference to an entire society, not just an individual person. We often hear millionaires say that they want to ‘give something back’- to the community, to their old school, to their sport, or sometimes even to poor people. Bill Gates has his Foundation, fighting malaria and other diseases. But often these gifts come with strings – the rich person is promoting him or herself, saving money on taxes, or just fooling himself that a few million out of a billionaire’s fortune is really helping others. Rich people therefore have to examine their reasons for helping other people to see if they are really just helping themselves. Perhaps we should be slower to criticize people who help, and quicker to help others ourselves. There will always be poor people in the world; equally, there will always be rich. But whether rich or poor we can all choose to help each other in different ways. Many people today have clean water, good food, comfortable houses and money to spend. Billions, however, live in terrible conditions, often without enough to eat. Why is it that, despite all our economic progress, so many people is poor? In this essay I will discuss if the growth of business and capitalism is keeping people in poverty. It’s easy to blame economic development for many problems. First of all, huge companies exploit the natural resources of countries. Nigeria’s oil, Zimbabwe’s diamonds and the Brazilian forest are used up, but no money goes to the ordinary people. Second, much industry leads to pollution or environmental damage. Huge dam projects in India force people from their homes, and pesticide poisoning kills millions. In addition, companies don’t care about employees. Some even move overnight to different countries, leaving thousands unemployed. But it’s impossible to turn the clock back and live without economic development. In the first place, any job is better than no job. People need money to buy food, build houses and pay for their children’s medicine. Second, business and trade mean that good governments have money to invest in better infrastructure. They can build better roads, hospitals, sanitation, and schools, thus attracting more development. Finally, large-scale production provides us with cheap clothes, food, electronic goods and other luxuries. Only free trade and open markets can give us this consumer lifestyle, for necessities as well as luxuries. In summary, we need to balance the greed of corporations with the needs of our people. Everyone deserves a chance to live a comfortable and dignified life. Despite levels of wealth one side and development unparalleled in history, billions of people on our planet are still uneducated, poorly housed Other side, sick, inadequately fed or even starving as a result of poverty. Is this a result of economic development, or can a rising tide of economic development give all humans a basic standard and dignity of life? In this essay, I will ask if economic progress is only for one group Thesis: what the essay will do in our society. It’s important to realize that economic activity alone is not enough Topic Sentence: Economic development does not always mean the end of poverty. to end poverty. In many poor countries, natural resources such as copper, oil or even land are being exploited Idea 1: companies are exploiting land and other valuable resources by local or foreign companies but with little benefit for the local people. Nigeria’s oil wealth and Zimbabwe’s diamonds are examples where money leaves the country or does not help the majority. Secondly, economic activity can have devastating consequences on the environment Idea 2:Economic development can mean environmental problems. Dam projects in India or the clearing of the rainforest can mean local people lose land and livelihoods. Furthermore, multinational companies are not tied to any country. Idea 3: multinational companies have no moral obligations to any country. Businesses move overnight and outsource to find even cheaper labor or resources, leaving unemployed people behind them. However, we can’t go back to a Stone-Age existence Topic sentence: We cannot live without developing our economies of barter and living in huts. More people than ever have access to electricity Idea 1: benefits of development, clean water, good schools, and medicine than ever before. Clothes, electronic luxuries such as phones, televisions and computers are cheap. All these things have come about through business and trade. They have provided income for governments to improve the life of their people. Secondly, other systems have failed: Idea 2: Communism and protectionism have not worked very well when India and China opened their markets and allowed people to do business, millions of people were lifted out of poverty. And even in countries where companies pay low salaries or do not look after the environment, Idea 3: Even a poor salary is better than no salary there are more opportunities for workers. What seems like a sweatshop in China or Mexico may be a first step in building a modern economy. In conclusion, we can’t live without economic progress. Conclusion One side (Opinion) All that we and our governments can do is try to make sure that it is in the interests of our society and our environment. Conclusion, future or recommendation. 373 words. The info below is not correct.